With the economy still struggling and the nation involved in multiple military operations overseas, the public’s political mood is fractious. In this environment, many political attitudes have become more doctrinaire at both ends of the ideological spectrum, a polarization that reflects the current atmosphere in Washington. For political leaders in both parties, the challenge is not only one of appeasing ideological and moderate “wings” within their coalitions, but rather holding together remarkably disparate groups, many of whom have strong disagreements with core principles that have defined each party’s political character in recent years. The most visible shift in the political landscape since Pew Research’s previous political typology in early 2005 is the emergence of a single bloc of across-the-board conservatives. The long-standing divide between economic, pro-business conservatives and social conservatives has blurred. Today, Staunch Conservatives take extremely conservative positions on nearly all issues – on the size and role of government, on economics, foreign policy, social issues and moral concerns. Most agree with the Tea Party and even more very strongly disapprove of Barack Obama’s job performance. A second core group of Republicans – Main Street Republicans – also is conservative, but less consistently so. On the left, Solid Liberals express diametrically opposing views from the Staunch Conservatives on virtually every issue. While Solid Liberals are predominantly white, minorities make up greater shares of New Coalition Democrats – who include nearly equal numbers 0f whites, African Americans and Hispanics – and Hard-Pressed Democrats, who are about a third African American. 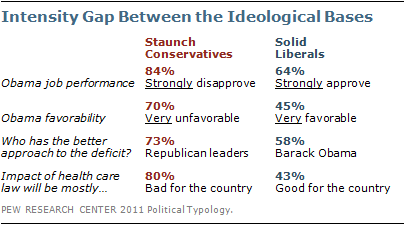 Unlike Solid Liberals, both of these last two groups are highly religious and socially conservative. New Coalition Democrats are distinguished by their upbeat attitudes in the face of economic struggles. Independents have played a determinative role in the last three national elections. But the three groups in the center of the political typology have very little in common, aside from their avoidance of partisan labels. Libertarians and Post-Moderns are largely white, well-educated and affluent. They also share a relatively secular outlook on some social issues, including homosexuality and abortion. But Republican-oriented Libertarians are far more critical of government, less supportive of environmental regulations, and more supportive of business than are Post-Moderns, most of whom lean Democratic. Disaffecteds, the other main group of independents, are financially stressed and cynical about politics. Most lean to the Republican Party, though they differ from the core Republican groups in their support for increased government aid to the poor. Another group in the center, Bystanders, largely consign themselves to the political sidelines and for the most part are not included in this analysis. These are the principal findings of the political typology study by the Pew Research Center for the People & the Press, which sorts Americans into cohesive groups based on values, political beliefs, and party affiliation. The new study is based on two surveys with a combined sample of 3,029 adults, conducted Feb. 22-Mar. 14, 2011 and a smaller callback survey conducted April 7-10, 2011 with 1,432 of the same respondents. This is the fifth typology created by the Pew Research Center since 1987. Many of the groups identified in the current analysis are similar to those in past typologies, reflecting the continuing importance of a number of key beliefs and values. But there are a number of critical differences as well. The new groupings underscore the substantial political changes that have occurred since the spring of 2005, when the previous typology was released. Today, there are two core Republican groups, compared with three in 2005, to some extent reflecting a decline in GOP party affiliation. However, Democrats have not made gains in party identification. Rather, there has been a sharp rise in the percentage of independents – from 30% in 2005 to 37% currently. Today, there are three disparate groups of independents, compared with two in 2005. While Republicans trail the Democrats in party affiliation, they enjoy advantages in other areas: The two core GOP groups are more homogenous – demographically and ideologically – than are the three core Democratic groups. And socioeconomic differences are more apparent on the left: Nearly half of Solid Liberals (49%) are college graduates, compared with 27% of New Coalition Democrats and just 13% of Hard-Pressed Democrats. The GOP still enjoys an intensity advantage, which proved to be a crucial factor in the Republicans’ victories in the 2010 midterm elections. For example, the GOP’s core groups – Staunch Conservatives and Main Street Republicans – express strongly negative opinions about last year’s health care legislation, while reactions among the Democratic groups are more mixed. Even Solid Liberals offer only tepid support for the bill – 43% say it will have a mostly positive impact on the nation’s health care, while somewhat more (51%) say it will have a mixed effect. However, maintaining solid support among the GOP-oriented groups in the center of the typology represents a formidable challenge for Republicans. The cross-pressured Disaffecteds highlight this challenge. They were an important part of the GOP coalition in 2010, but were lackluster supporters of John McCain two years earlier. Like the core GOP groups, most Disaffecteds (73%) view government as nearly always wasteful and inefficient. At the same time, a solid majority of Disaffecteds (61%) say the government should do more to help needy Americans even if that means going deeper into debt. Libertarians, the other Republican-leaning group, overwhelmingly oppose expanding aid for the poor if it means increasing the nation’s debt. Yet on immigration and homosexuality, Libertarians’ views differ markedly from those of the core Republican groups. Fully 71% of Libertarians say homosexuality should be accepted by society; nearly as many Staunch Conservatives (68%) say it should be discouraged. Many of the political values and attitudes of Post-Moderns, young, Democratically-oriented independents, fit awkwardly with those of core Democratic groups. Post-Moderns overwhelmingly voted for Obama in 2008, but their turnout fell off dramatically last fall, which contributed to the Democrats’ poor showing in the midterms. Compared with the core Democratic groups, Post-Moderns are less supportive of increased aid for the needy and are far less likely to view racial discrimination as the main obstacle to African American progress. The new typology finds a deep and continuing divide between the two parties, as well as differences within both partisan coalitions. But the nature of the partisan divide has changed substantially over time. More than in the recent past, attitudes about government separate Democrats from Republicans, and it is these beliefs that are most correlated with political preferences looking ahead to 2012. In 2005, at the height of the Iraq war and shortly after an election in which national security was a dominant issue, opinions about assertiveness in foreign affairs almost completely distinguished Democrats from Republicans. Partisan divisions over national security remain, but in an era when the public’s focus is more inward-looking, they are less pronounced. As in recent years, beliefs about the environment, business, immigration and the challenges faced by African Americans are important fissures between the parties, though to some extent within them as well. In general, there is far more agreement across the two core GOP groups than the three core Democratic groups. Staunch Conservatives and Main Street Republicans express highly critical opinions about government performance and are both deeply skeptical of increased government aid to the poor if it means adding to the debt. Yet Staunch Conservatives have much more positive opinions about business than do Main Street Republicans. Attitudes about the environment also divide the two core GOP groups: 92% of Staunch Conservatives say that stricter environmental laws cost too many jobs and hurt the economy; just 22% of Main Street Republicans agree. The differences among core Democratic groups show up across a wider range of fundamental political values. Social and moral issues divide Solid Liberals, who are more secular, from other Democratic groups who are much more religious. Opinions about business, immigration and the economic impact of environmental laws and regulations also divide the Democratic groups. For instance, more than half of Hard-Pressed Democrats (54%) say that stricter environmental laws and regulations cost too many jobs and hurt the economy; just 22% of New Coalition Democrats and 7% of Solid Liberals share this view. Race and ethnicity are factors in some of the opinion differences among Democrats. New Coalition Democrats, who are roughly a quarter Hispanic, have positive views of immigrants. Fully 70% say immigrants strengthen the country because of their hard work and talents. Hard-Pressed Democrats – who are mostly white and African American – take a dim view of immigrants’ contributions. Just 13% say immigrants strengthen the country, while 76% say they are a burden because they take jobs and health care. Age also is a factor in partisanship and political values. 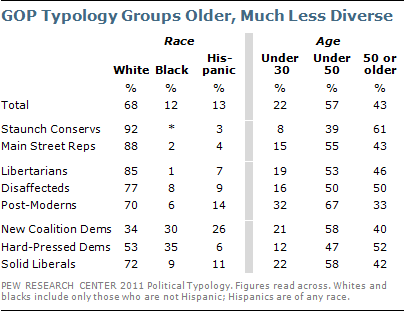 Younger people are more numerous on the left, and older people on the right. However, many young people think of themselves as independents rather than as Democrats. Post-Moderns, Democratic-oriented independents, are by far the youngest group in the typology, but they often deviate from traditional Democratic orthodoxy and are not consistent voters. Older people, who have increasingly voted Republican in recent years, are found disproportionately in the Staunch Conservative bloc – 61% are 50 or older. And this group is highly politically engaged; 75% say they follow government and public affairs most of the time. Staunch Conservatives also include by far the largest share of Tea Party supporters – 72% of Staunch Conservatives agree with the movement. The Tea Party’s appeal is deeper than it is wide. There is no other typology group in which a majority agrees with the Tea Party. 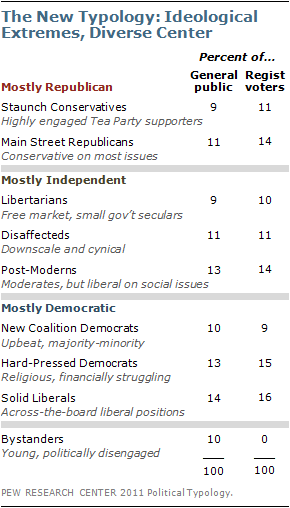 Aside from Staunch Conservatives, Libertarians are most supportive (44% agree). The survey suggests that while the Tea Party is a galvanizing force on the right, strong disapproval of Barack Obama is an even more powerful unifying factor among fervent conservatives. No fewer than 84% of Staunch Conservatives strongly disapprove of Obama’s job performance and 70% rate him very unfavorably personally. Ardent support for Obama on the left is no match for this – 64% of Solid Liberals strongly approve of him, and 45% rate him very favorably. Majorities in most typology groups say the country will need both to cut spending and raise taxes to reduce the budget deficit. Staunch Conservatives are the exception – 59% say the focus should only be on cutting spending. Core GOP groups largely prefer elected officials who stick to their positions rather than those who compromise. Solid Liberals overwhelmingly prefer officials who compromise, but the other two Democratic groups do not. For Staunch Conservatives it is still “Drill, Baby, Drill” – 72% say that expanding exploration for and production of oil, coal and natural gas is the more important energy priority. In most other typology groups, majorities say developing alternatives is more important. Republican groups say the Supreme Court should base rulings on its interpretation of the Constitution “as originally written.” Democratic groups say the Court should base its rulings on what the Constitution means today. Main Street Republicans and GOP-oriented Disaffecteds are far more likely than Staunch Conservatives or Libertarians to favor a significant government role in reducing childhood obesity. Solid Liberals are the only typology group in which a majority (54%) views democracy as more important than stability in the Middle East. Other groups say stable governments are more important or are divided on this question. New Coalition Democrats are more likely than the other core Democratic groups to say that most people can make it if they are willing to work hard. More Staunch Conservatives regularly watch Fox News than regularly watch CNN, MSNBC and the nightly network news broadcasts combined. There are few points on which all the typology groups can agree, but cynicism about politicians is one. Majorities across all eight groups, as well as Bystanders, say elected officials lose touch with the people pretty quickly. Staunch Conservatives overwhelmingly want to get tougher with China on economic issues. Across other typology groups, there is far more support for building stronger economic relations with China. The allied airstrikes in Libya divide Democratic groups. Solid Liberals and New Coalition Democrats favor the airstrikes, but about as many Hard-Pressed Democrats favor as oppose the operation. Michelle Obama is popular with Main Street Republicans, as well as most other typology groups. But Staunch Conservatives view the first lady unfavorably – and 43% view her very unfavorably. The 2011 typology divides the public into eight politically engaged groups, along with a ninth group of less engaged Bystanders. It is the fifth of its kind, following on previous studies in 1987, 1994, 1999 and 2005. Using a statistical procedure called cluster analysis, individuals are assigned to one of the eight core typology groups based on their position on nine scales of social and political values – each of which is determined by responses to two or three survey questions – as well as their party identification. Several different cluster solutions were evaluated for their effectiveness in producing cohesive groups that are distinct from one another, substantively meaningful and large enough in size to be analytically practical. The final solution selected to produce the political typology was judged to be strongest from a statistical point of view and to be most persuasive from a substantive point of view. As in past typologies, a measure of political attentiveness and voting participation was used to extract the “Bystander” group, people who are largely not engaged or involved in politics, before performing the cluster analysis. For a more complete description of the methodology used to create the typology, see About the Political Typology. For more information about the survey methodology seen About the Surveys.